Rose tattoos are universally inked by both men and women. Including this flower in a clock tattoo further add to the aesthetic appeal and give a life element to the design. This tattoo can be a reminder of a loved one. 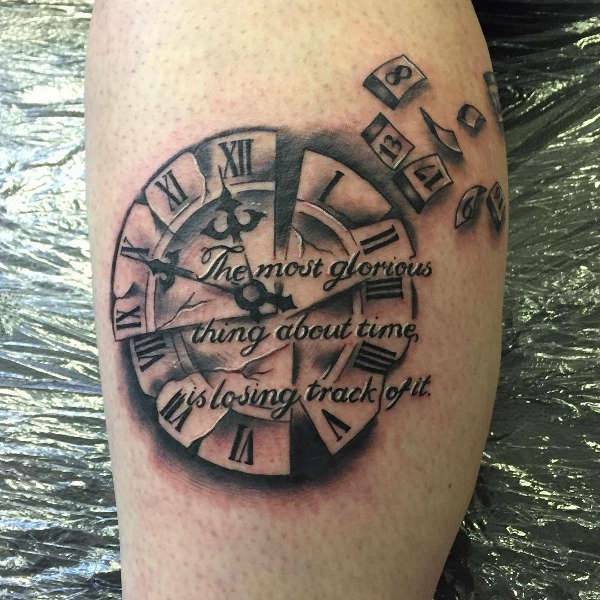 The best way to remember a high achievement or the loss of someone special is with a broken clock tattoo. They are also ideal for portraying freedom from an addiction or when you overcame an obstacle. Including a quote or date will help in making the meaning clear. 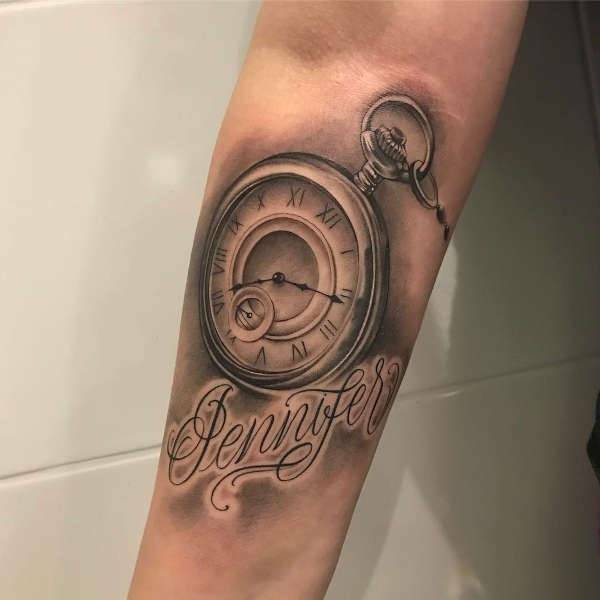 If you love tattoos because of their beauty, then this clock sleeve tattoo design is perfect for you. 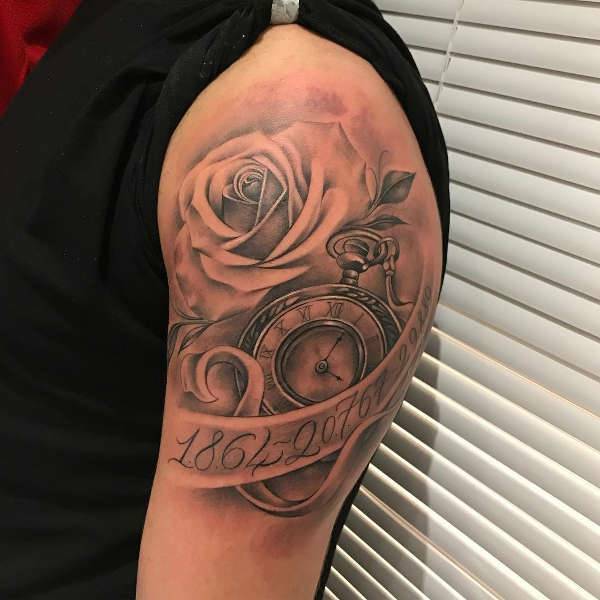 The simple design makes use of black ink and light shadings to create a balance between a rose, clock, and date. This sleeve tattoo is ideal for men. 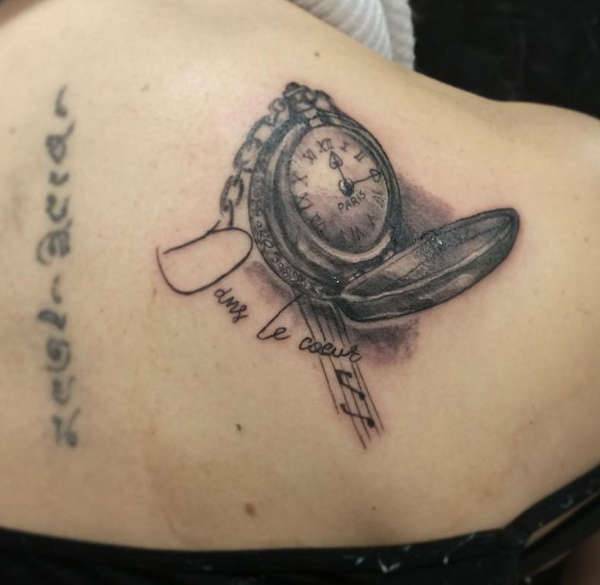 If you want a clock tattoo with a rich Spanish history, then get inspiration from the painting: The Persistence of Memory by Salvador Dali. The melting clock design is a surrealist masterpiece that symbolizes how time has no power in the dream world. 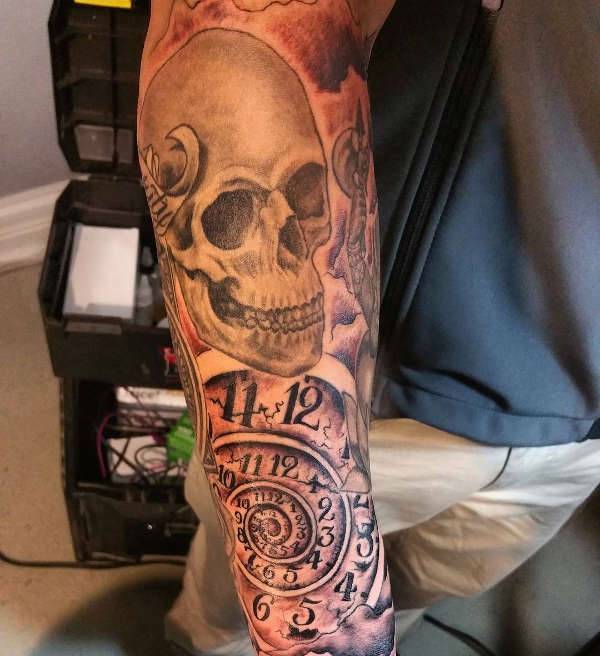 A skull with a clock tattoo carries a symbolic meaning of death. It can also show a dark period in someone’s life. The black and gray ink work further enhances the seriousness of the message. Go for a large body art and ink it as a sleeve tattoo. 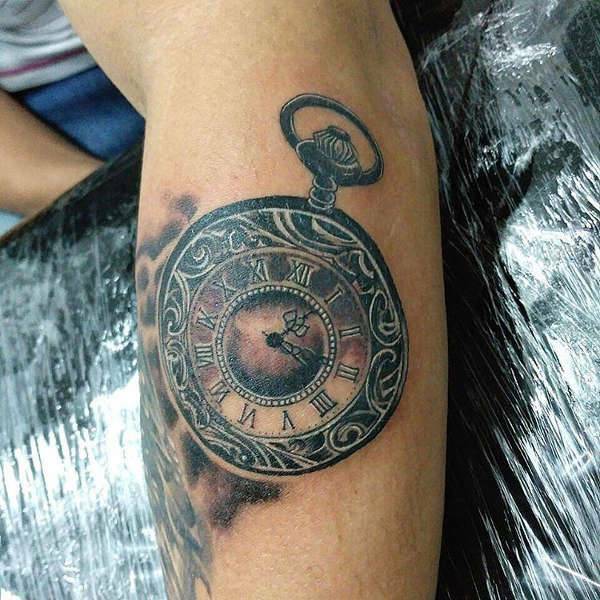 Old clock tattoos which are also known as vintage and grandfather designs are a representation of one’s tradition. They signify a person who lived in past eras or maybe you just want to link yourself with past time. 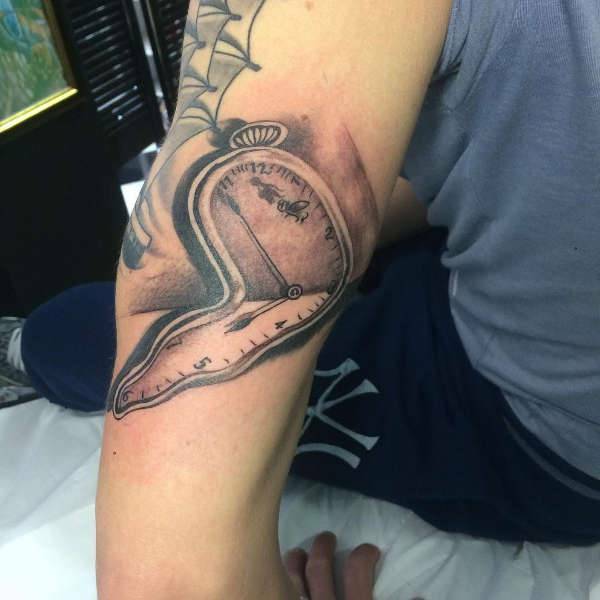 A 3D clock tattoo gives time a realistic appeal. To make the design more appealing and visible opt for wrist tattoos. 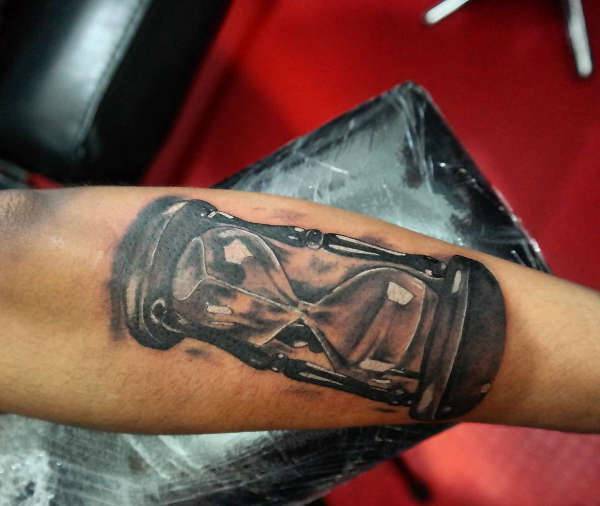 Even in with a simple clock design, the three-dimensional illusion will give your tattoo a lifelike effect. 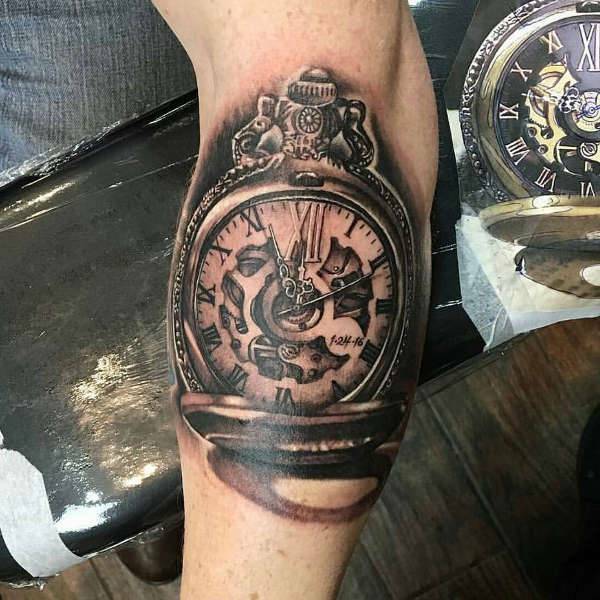 Traditional clock tattoos blend the seconds, minutes and hour hand with mechanical gears to create a design that is visually appealing. Small clock tattoos on the back are for ladies who want a simple, subtle design that is also catchy and unique. 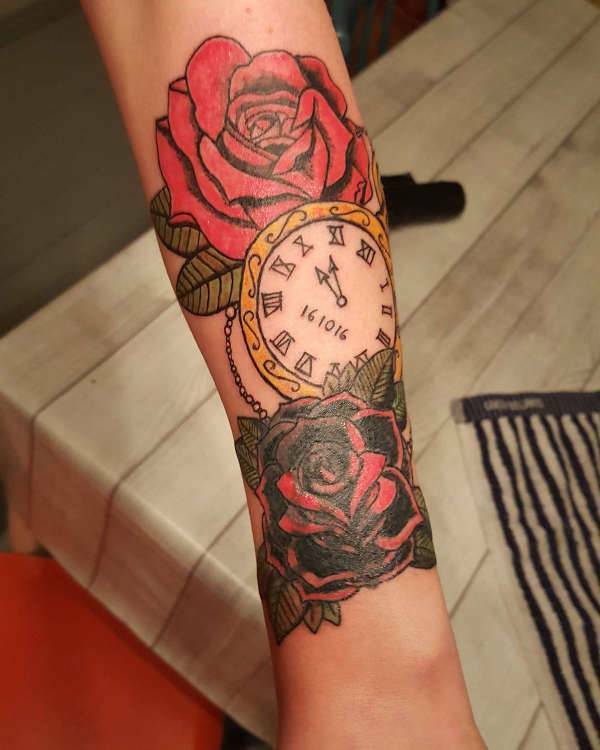 Clock tattoos do much more than tell time. Depending on an individual, these tattoos have different symbolic meanings and add an aesthetic appeal to whichever body part they are placed. To convey the right message, the style of the clock must be considered. An older clock model is perfect for drawing a tribal tattoo.